Starr Playground was the 501st playground in the Parks system when it opened on Christmas Day, 1947. In the Depression-era 1930s, federal aid through the Works Progress Administration (WPA) enabled the City to greatly expand and improve its play spaces. 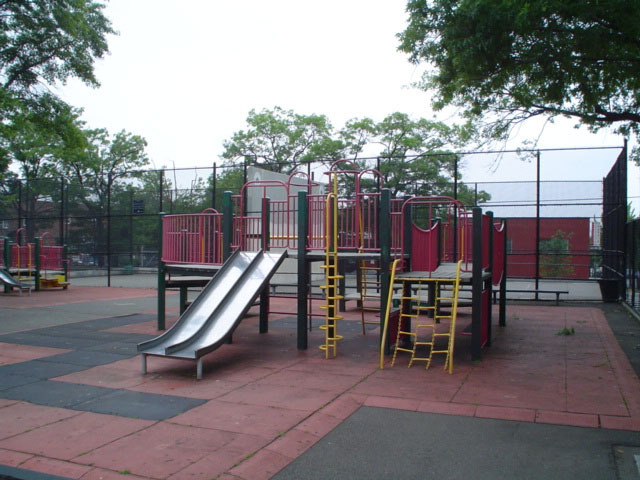 Under the strict stewardship of Parks Commissioner Robert Moses (1888-1981), new playgrounds were constructed at an astonishing rate throughout the decade. Moses was able to harness the massive manpower of the Parks Department, whose ranks had swollen to more than 80,000 workers due primarily to the influx of federal money to stem unemployment through large public works projects. When Moses assumed the Commissionership in 1934, there were only 119 playgrounds in New York City. By 1960, the end of the Moses reign at Parks, there were 777. Typically, these playgrounds were characterized by large asphalted areas adorned with sandboxes, see-saws, metallic jungle-gyms and monkey bars, swing sets and slides. They were designed for the use of a wide age group, from small children to those of early adolescence. The City acquired this land, located between Onderdonk and Willoughby Avenues and Starr Street, in 1936 and jurisdiction was transferred to Parks in two parcels between 1940 and 1942. The playground features play equipment with safety surfacing, benches, a flagpole with a yardarm, a drinking fountain, two handball courts, one full basketball court, an asphalt softball court, and a stone turtle statue.